Congregating and loitering in such a way as to cause inconvenience or alarm to others is prohibited. Groups must keep moving. Seating areas are provided for the convenience of shoppers only. Obscene gestures, profanity, loud, rude, disruptive or threatening behavior, as well as audible playing of radios interferes with a pleasant shopping experience for our guests and will not be tolerated. Running, horseplay, throwing any type of object, or the use of skates or skate boards on premises is prohibited. Absolutely no disruptive conduct of any nature will be tolerated. Towne Square Mall is a smoke-free mall and smoking is prohibited in the common area. Smoking is allowed outside the mall entrances by persons 18 years of age and older. Smoking by persons under 18 is prohibited. Soliciting, handbilling, conducting surveys, peddling are not permitted on mall premises. Appropriate dress, including shirts (buttoned) and shoes must be worn. Also swimsuits and other beachwear is prohibited as well as clothing with objectionable messages on them. Alcoholic beverages are permitted in licensed establishments only. Littering creates unsightly conditions as well as other hazards. Please use trash receptacles found throughout the mall. All animals are prohibited with the exception of trained service animals. Unauthorized use of the mall, including taking pictures or videos, or unauthorized use of parking areas is prohibited without written permission from the mall management. Any act which causes risk of physical harm to persons or property is prohibited. Towne Square Mall is not responsible for injury to anyone walking for health purposes in the mall. Possession of any weapon, whether legal or not is prohibited. Federal, State, and Local Law Enforcement personnel who carry weapons are excluded, but they should make an attempt to carry them in such a manner to keep from causing alarm to guests. Any act defined by Federal, State, or Local statutes or ordinances as a criminal act is prohibited. 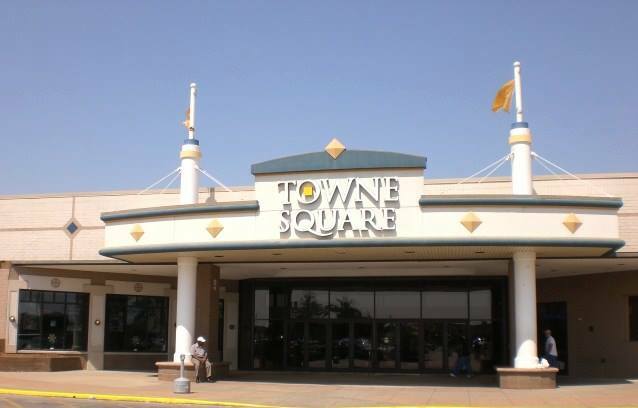 Towne Square Mall is open for retail purposes only after 10:00 am Monday- Saturday and after 12:00 pm on Sunday. These rules are not all inclusive of every behavior that is to be regulated on mall property. Towne Square Mall reserves the right to prohibit any behavior or actions which we feel may be inappropriate and may be alarming or annoying to our guests. Your cooperation in abiding by these rules is appreciated. Towne Square Mall reserves the right to request that those who refuse to comply leave the property. Those refusing to do so will be subject to prosecution.